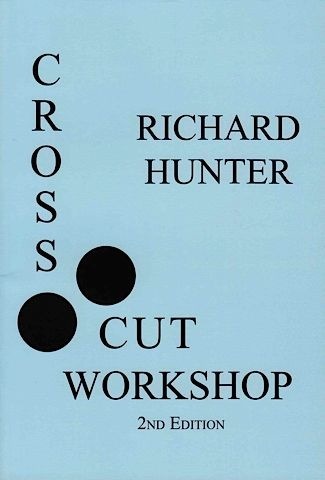 Cross-Cut Workshop is a book by Richard Hunter. It originated as a series in the British Go Journal (starting in issue 92, Autumn 1993). As the name suggests, it is all about cross-cuts and tells us there is more to it than extending from a crosscut. First published by Slate & Shell in July 2001. The second edition (2008) is expanded and improved. See the publisher's blurb. Stefan was also totally smitten by Richard's book, and wants to start a series on cross cuts in pro games in order to practice. The purpose is to first visualise the patterns as described in the book, then evaluate them in the context of the game, select one and finally, compare with the actually played sequence in the game. The objective is to develop a working knowledge of cross cut patterns for tournament play. This is similar to life and death/tesuji pattern matching training: "if you don't want to go through this sort of heavy analysis process in a game, you better do your homework, right?"